Pursuant to the provisions of paragraph, Article 11, of R.A. No. 7836, otherwise known as the Philippine Teachers Professionalization Act of 1994 and paragraph (a), section 6, P.D. No. 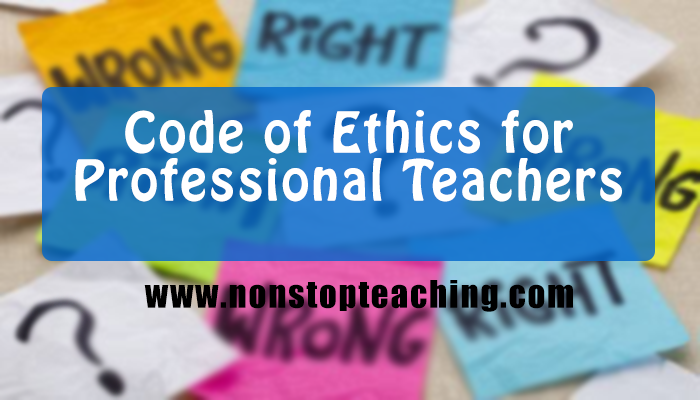 223, as amended, the Board for Professional Teachers hereby adopt the Code of Ethics for Professional Teachers. Teachers are duly licensed professionals who possesse dignity and reputation with high moral values as well as technical and professional competence in the practice of their noble profession, and they strictly adhere to, observe, and practice this set of ethical and moral principles, standards, and values. Section 2. This Code covers all public and private school teachers in all educational institutions at the preschool, primary, elementary, and secondary levels whether academic, vocational, special, technical, or non-formal. The term “teacher” shall include industrial arts or vocational teachers and all other persons performing supervisory and /or administrative functions in all school at the aforesaid levels, whether on full time or part-time basis. Section 1. The schools are the nurseries of the future citizens of the state; each teacher is a trustee of the cultural and educational heritage of the nation and is under obligation to transmit to learners such heritage as well as to elevate national morality, promote national pride, cultivate love of country, instil allegiance to the constitution and for all duly constituted authorities, and promote obedience to the laws of the state. Section 3. Every teacher shall merit reasonable social recognition for which purpose he shall behave with honour and dignity at all times and refrain from such activities as gambling, smoking, drunkenness, and other excesses, much less illicit relations. Section 6. Every teacher is intellectual leader in the community, especially in the barangay, and shall welcome the opportunity to provide such leadership when needed, to extend counselling services, as appropriate, and to actively be involved in matters affecting the welfare of the people. Section 8. A teacher possesses freedom to attend church and worships as appropriate, but shall not use his positions and influence to proselyte others. Section 5. Every teacher shall use the teaching profession in a manner that makes it dignified means for earning a decent living. Section 1. Teachers shall, at all times, be imbued with the spirit of professional loyalty, mutual confidence, and faith in one another, self-sacrifice for the common good; and full cooperation with colleagues. When the best interest of the learners, the school, or the profession is at stake in any controversy, teachers shall support one another. 1. Every teacher shall make it his duty to make an honest effort to understand and support the legitimate policies of the school and the administration regardless of personal feeling or private opinion and shall faithfully carry them out. 1. All school officials shall at all times show professional courtesy, helpfulness and sympathy towards teachers and other personnel, such practices being standards of effective school supervision, dignified administration, responsible leadership and enlightened directions. Section 4. A teacher shall not accept favours or gifts from learners, their parents or others in their behalf in exchange for requested concessions, especially if undeserved. Section 2. Every teacher shall inform parents, through proper authorities, of the progress and deficiencies of learner under him, exercising utmost candour and tact in pointing out the learner's deficiencies and in seeking parent’s cooperation for the proper guidance and improvement of the learners. Section 2. A teacher shall place premium upon self-discipline as the primary principle of personal behaviour in all relationships with others and in all situations. Article 11, of R.A. No. 7836, otherwise known as the Philippine Teachers Professionalization Act of 1994 and paragraph (a), section 6, P.D. No. 223, as amended, the Board for Professional Teachers hereby adopt the Code of Ethics for Professional Teachers.